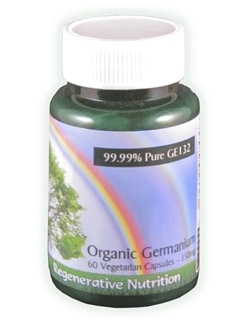 Organic Germanium aids fundamental processes within your body & can be used alongside therapy for any condition. As a single remedy, it is particularly important for cancer care. Germanium is contained in most medicinal herbs & food, in fact the therapeutic power of such herbs may be largely related to the amount of Organic Germanium present. Germanium works at a molecular level to eliminate free radicals, especially unburnt hydrocarbons within the cells. Maintenance usage: 3 capsules per day (minimum suggested usage). This can be used for gradual health boosting, detoxification and as a long term anti-oxidant and cell oxygen enhancer and general health protector. Intensive usage: 6 to 8 capsules per day. This can be used for significant health problems, infections, acute illness and/or as part of a regenerative program to help detoxify old acid wastes and to regenerate stagnant glands and organs. For those under 25kg or over 80kg Please contact us at enquiries@regenerativenutrition.com with your details for personal recommendations. It is more effective to split your selected dose over 2-4 times a day, depending on how many per day you are taking. For example, if your selected dose is 8 capsules per day it is preferable to take 2 on rising and then a further 2 before each of your 3 main meals. If however you are taking a maintenance dose of 3 capsules per day, then take one before each meal. Due to Germanium's powerful action it is generally advisable to introduce it gradually into your system over a period of two weeks or more. For example, the first week take 1 capsule per day, the next week 1 capsule twice per day and so on until your desired usage level is gained. More robust individuals can start at higher levels and increase up to their desired usage level faster. For example double the levels suggested above. Conversely, the weaker/more frail individual should start at lower levels and increase up to their desired usage level more slowly. For example half the levels suggested above (capsules can be opened and the content split in halves). If systemic changes are perceived to be too quick, then do not take Organic Germanium one day per week. This should slow down the changes. 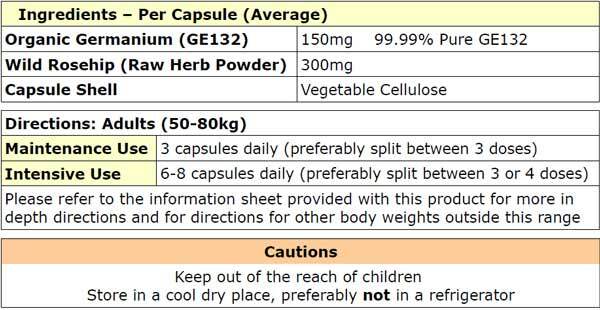 For urgent/serious health problems, such as cancer, pain is often relieved in less than an hour by taking a high dose (8 capsules for example). After having reviewed the main literature on Organic Germanium, looked in detail at the clinical results including those of lifelong Germanium researcher Dr Ashi and experienced it's results first hand, I now regard Germanium as an essential tool for all who want to achieve the best of health and wellness. There are many excellent looking remedies and supplements, so what is it that distinguishes Organic Germanium? In our opinion, Organic Germanium has a prime place in any significant/fundamental health recovery program. It "seizes control” of the basic mechanisms of health and disease and can lead to a successful outcome in virtually all common chronic and acute disease states. The basis of chronic disease can be understood when we consider the fact that the very act of breathing and eating cause harmful byproducts to build up in the body. Fuel (food) is taken in, burnt with oxygen (metabolised), acid waste is produced, which is never fully eliminated from the body. Add to this all of the non-nutrient content, such as toxins, chemical additives etc., that are taken into one's body (orally, environmentally and transdermally) and it's little surprise that at some point the body will cease to cope with it and become "sick”. Low oxygen levels anywhere in the body lead to the development of disease, such as a proliferation of chronic infection such as Candida. Cancer cells will develop successfully only in a low oxygen environment. As can be seen from the list above Organic Germanium is effective in many aspects of disease resolution, not just a single action. Principally, at the heart of it's efficacy, is it's dual role as an oxygenator and a superior antioxidant. Furthermore, the chelating effect makes it especially helpful for mercury, cadmium, and similar heavy metal poisoning. A surprisingly common occurrence and one of the foundations of modern disease. We are as much electrical organisms as we are biological. Organic Germanium as a semi-conductor exchanges electrons in a way that delivers the all-encompassing health benefits detailed previously. Related to this discussion concerning the adrenal glands, the major gland that adjusts to various types of demands, adaptations and so called stress, is the word adaptogen. Organic Germanium is an adaptogen. An adaptogen is defined as: a substance which helps to normalize body functions indirectly. An adaptogen is classified as nontoxic and having a nonspecific effect, enhancing your ability to cope with any stress (physical, emotional, or chemical) as needed. Two further xamples of adaptogens are Ginseng and Peruvian Maca. Analysis of the most effective adaptogens in the plant kingdom reveal that they have a greater germanium content than other herbs and root tonics. Adaptogenic effects are thought to be primarily focused on the adrenal glands. The most important thing to come out of this review is changes to dosage levels, as follows. Organic Germanium aids fundamental processes within the body and can be used alongside therapy for any condition, and as a single remedy. It is particularly important in cases of cancer. Organic Germanium is contained in most medicinal herbs & food, in fact the therapeutic power of such herbs may be largely related to the amount of Germanium present. Germanium is electronic therapy of the highest order & works at a molecular level to eliminate free radicals, especially unburnt hydrocarbons within the cells; in combination with its oxygen enhancing abilities, it is one of the most potent healing remedies ever produced. For a more in depth look at Germanium and it's implications for cancer care please click here, for further information about our full cancer care protocol, please click here. Neutralises positive charges, mops them up and discharges them in conjunction with converting cellular and tissue toxins to water. It should be noted that toxins arise from consuming any food, since some of our food remains as 'unburnt cellular debris' the germanium completes this 'burning process' by donating electrons and conserving cellular oxygen. These processes are so fundamental to the preservation and restoration of health that this 'electronic' therapy is one of the most potent available in a single remedy for many diseases, and health maintenance. Greatly enriches oxygen in the living body (a lack of oxygen is a key factor in ill health). Perhaps the most potent cell detoxification remedy available. The dosage can be reduced after a period of relatively high dose, once improvement has set in and been maintained for a few weeks. Organic Germanium is non toxic at levels far above those advised, so the dose recommendations are based on what is required for the best therapeutic response. In appearance germanium is a metal, but it is completely without metallic properties. Some scientists refer to it as a non-metal, while Dr. Asai and others in Japan classified it as a semi-metal. Germanium is common in the universe and can be found in various places: food, plants, peat and coal deposits, in the earth's crust. Intriguingly, Germanium can be found in extremely high levels in the water of Lourdes, where people today continue to travel seeking healing. It rarely forms it's own deposits, but is found in small levels in the ores of, lead, zinc and copper for example. It can be found in highly concentrated amounts in certain coals. In 1945, Dr. Asai helped to establish the Coal Research Foundation in Japan and it was from here that he began his original research. Dr. Asai found that Ge-Oxy 132 occurs in high concentrations in medicinal plants and is therefore one of the main active principles in many age old, natural, remedies. Experiments led to the observation of other interesting phenomena. When only a small quantity of germanium solution was used, the growth of various plants was greatly accelerated and their flowering period was advanced. The electronics industry had been extracting inorganic germanium from coal, and it was utilised for the semi-conducting properties and in the development of transistors and diodes, both of which came to play a leading role in modern electronics. Electronics engineers have since come to marvel at the whimsical and magic like behaviour of semiconductor electrons, and the quantum revolution soon spread to other fields. In the field of biochemistry, quantum biology and electrobiology emerged. Dr Asai established that as living organisms also come under the physical laws of matter, that the semiconductor phenomenon could have an impact on the living body with interesting biological effects. There are scare stories on the internet and elsewhere claiming that Germanium is dangerous. Here is the truth behind these stories. Over 20 years ago, a certain company made Germanium with inorganic germanium (germanium oxide), in considerable proportion. Two people who took large quantities died of kidney failure (They had also been using a number of pharmaceutical drugs, so it was hardly a proven corellation). This was seized upon by some medical "authorities" to be used as "political" ammunition against all forms of Germanium. Organic Germanium had been proving so potent and popular it was an opportunity to launch a smear campaign appearing in newspaper headlines back in the 1980's. Consequently all types of Germanium supplements were tarred with the same brush. To add insult to injury some writers deliberately blurred the distinction between Organic Germanium (Ge-132) and inorganic Germanium, saying they were both toxic. This of course served the vested interests of big pharmaceutical companies. Organic Germanium has been in use by hundreds of thousands of people since then and is available in many countries (including Japan where it was first developed by Dr. Asai). Japan has strict control procedures and would not allow toxic products on the market. If you read DR Asai's book, you will see it is a very safe supplement, tested many times for safety. All genuine Organic Germanium comes with an analysis certificate stating the content level of inorganic germanium which must be within specification. We import Organic Germanium that is made, analysed and certified as compliant with the original Japanese specification. We can provide a cost effective product by encapsulating the Organic Germanium ourselves. The picture has been further clouded by unscrupulous marketing (usually from the USA ) by companies charging vast sums for their Germanium claiming that all other brands are either inferior or downright dangerous. This is bad for the truth and bad for the health industry as a whole. We have a short and interesting book about Organic Germanium available for download. We recommend this small download to everyone interested in energy medicine and therapeutic and preventive supplementation. Germanium: A New Approach to Immunity - by Betty Kamen, ph.D (143kb) Right click to save to your computer, or left click to open in your browser. Without Dr Kazuhiko Asai PhD, (deceased), the incredible healing benefits of Germanium may never have been discovered. The existence of Germanium was predicted by a Russian chemist - Omitri Mendeleev who was the proponent of the periodic law in chemistry; he left gaps for as yet undiscovered elements to be entered - the 32nd column was left for an element he called "Ekasilicon". A few years later, in 1886, a German chemist, Clemens Winkler, discovered a new element that fitted the description, he called this new element Germanium paying tribute to his homeland. It was not until 1945 that Dr. Asai's lifetime of dedication to exploring Germanium began. Quoting Dr Kazuhiko Asai PhD. I have whole-heartedly devoted myself to the study of germanium for close to 30 years. At the outset, I intended to describe the therapeutic efficacy of germanium. Gradually, however, I have been led to believe the existence of something in germanium that cannot be fully explained in terms of science in its present stage of development, when I see that obstinate diseases for which modern medicine is powerless are successfully cured by our germanium therapy. Now I consider that the answer lies in the realm unknowable by science referred to by Alexis Carrel. As will be seen later, the organic germanium compound can be regarded without exaggeration as an effective means of combating almost any disease. Nonetheless, for assuring its efficacy and the health of the body, the following two conditions have to be met. One is to keep a well balanced diet in order to maintain the acid alkali equilibrium of the body fluids. The other is to relieve stress to keep a stable mental state for maintaining the equilibrium of the autonomic nervous system. The entire transcript of Dr. Asai's book is available online here Miracle Cure - Organic Germanium. Dr. Asai dedicated himself entirely to the study of Germanium, his passion, commitment and sacrifice have had enormous impact upon many people's lives. Whilst it is a fairly long document, the book is recommended reading. Some extracts follow. We now offer the complete book, as a downloadable .pdf file. Please click here it's under 1mb (864kb), so won't take long to download. Right click to save to your computer, or left click to open in your browser. "In the Germanium Clinic which I supervise, no pharmaceuticals are used, only my organic germanium. Therefore, when a patient comes to the Clinic he receives a medical examination and the appropriate prescription of germanium is given. In spite of the fact that no additional medicine is given, people come daily from all over Japan, and close to twenty per cent of them become so-called "germanium believers," continuing to take the compound over a long period. Of course, the purpose of the treatment has already been achieved, but repeated use has not once caused any side effects or any other complaint up to the present time, nor do I expect any in the future. On the other hand, requests from practicing physicians have greatly increased. Some of these doctors say that thanks to germanium, their patients are extremely grateful, and now without germanium they would be unable to continue their practice". "The effect of the compound is so unlike that of any medicine heretofore discovered that I hesitate to call germanium a medicine. I would rather call it a health-giving substance - i.e., a substance which restores a condition of health to those afflicted with disease, and which sustains a condition of health in those who are healthy. The basis for this, first, is its seemingly universal applicability and beneficial effect in the treatment of apparently any disease in adults and children. Secondly, it is without the adverse effects associated with medicines as we know them". "Doctors had diagnosed my illness as a severe case of rheumatism complicated by arthritis and had given little hope of improvement. True, the organic germanium compound had just been synthesized, but it was still in the experimental stage. Usually with a new medicine, extensive toxicity tests are made before it is used on people. I decided that my own illness would be its first real test. My decision was not entirely based on blind faith, however. Prior to the discovery, my years of research with plants and animals had indicated that its overall effect would be beneficial, or harmless at least. Furthermore, some scientific data from the Soviet Union indicated that germanium was non-toxic. I took some of the white, powdery organic germanium with water. Improvement was slow at first, but I continued to take the solution in large dosages for several days. Gradually, I began to feel better and in ten days I was up and walking around the house-at times feeling robustly healthy. Since the rheumatic affliction I was suffering from is generally regarded as incurable by modern medicine, I had been visiting an acupuncturist in the neighbourhood in an attempt to relieve my pains. Upon examination after only a few visits, the acupuncturist was astounded to find that my body had already healed to an unbelievable extent". "I wasted no time in initiating toxicity tests with animals at an authoritative research institute. The tests they ran included those for acute, sub acute, and chronic toxicity, as well as deformity - producing effects. The results of all the tests showed the compound to be completely non-toxic and harmless. (Refer to Appendix 2-1, 2-2, Toxicity of Organic Germanium.) With thorough assurance that the compound was non-toxic, I was able to obtain financial backing and opened a clinic on the outskirts of Tokyo. My doctor friends agreed to rely on germanium as much as possible in their treatment, and together we witnessed the remarkable recovery of patients with diseases that had hardly responded to medical treatment. Thorough records of the patients' reactions to treatment and course of recovery were maintained to develop an adequate explanation of the mechanism by which the compound heals. People taking my organic germanium continued to do so in increasing numbers when they saw its remarkable results". "By watching all the changes that took place with patients following the administration of the compound, I was able to conclude that its healing powers may be attributed to the fact that it brings about a sharp increase in the body's supply of oxygen: A patient will feel a certain warmth surging throughout his body within 10 minutes of so after taking the compound - some people actually feel as if they have been given a mixture that included alcohol. yawning soon ceases, blood becomes less viscous and complexions take on a healthy glow. Carbon monoxide poisoning is quickly cured, and people feel cheerful, sleep soundly and wake in good humour. They also show evidence of increased mental powers, along with numerous other overall positive". "Morbid tissues are generally characterized by oxygen deficiency. Accumulation of H+ radicals tends to destroy cells and tissues which gradually accumulate to cause disorders which in turn deteriorate in a morbid condition generated for various reasons. If oxygen could be selectively and locally, fed to this lesion, oxygen would combine with the accumulated H+ radicals to restore the deteriorated tissues, thereby cutting the vicious circle of accumulation of deteriorated tissues and disorders, restoring the normal functions of the tissues. The basis of the theory of the mechanism of the compound is that germanium takes the form of a sesquioxide. Oxygen readily combines with hydrogen, so it becomes apparent that hydrogen will strongly bind with the oxygen atoms of the compound, consequently bringing about a dehydrogenating reaction which is the mechanism by which germanium eliminates harmful substances causing disease in the body. Consider for a moment the basic fact of the life process whereby food is burned by the body to give energy, while carbon dioxide (C02) and hydrogen (H2) are created. CO2 is discharged from the lungs when we exhale, and H2 combines with oxygen to form water which is discharged in the urine and sweat. As mentioned previously, hydrogen may be referred to as a positive ion, which is as useless to the body as dust clogging the workings of a machine. To insure that the body functions normally, hydrogen must be removed, but for complete removal a large quantity of oxygen is needed. The germanium compound with its strong dehydrogenating effect takes the place of oxygen in combining with hydrogen to eliminate the latter from the body. In fact, all traces of germanium are discharged from the body through the digestive tract within 20 to 30 hours". "As will be seen later. the organic germanium compound can be regarded without exaggeration as an effective means of combating almost any disease. Nonetheless, for assuring its efficacy and the health of the body, the following two conditions have to be met. One is to keep a well balanced diet in order to maintain the acid alkali equilibrium of the body fluids. (See Dietary guidelines, Zeolite, Sea greens, and Barley grass as ways to aid acid alkali balance). The other is to relieve stress to keep a stable mental state for maintaining the equilibrium of the autonomic nervous system. If any one of these equilibriums is broken, a morbid change is likely to occur somewhere in the body. The oxygen needed for the human body is supplied through respiration, and observing the necessities for the maintenance of human life, the first thought is the need for oxygen supplied to the body through respiration, while the need for nourishment in the form of water and food and sleep follow a close second. With these conditions in mind, it is up to man to choose the proper type of food. For this reason, it is important to keep a well balanced diet. For maintaining health or curing a disease, it is of utmost importance to adhere to a diet that includes food which will keep the pH of the body fluids slightly alkaline at 7.2 to 7 4". In my mind, carcinogenic or, cancer producing substances and unsaturated compounds with their excess of molecular "hands" to use up the available oxygen in the body are one and the same. (iii) The other major cause of oxygen deficiency in the body, perhaps that to which we should pay the most attention, is the mind. A theory of Professor Hans Selye of the University of Montreal, Canada, is that not only humans but animals develop an unbalanced secretion of hormones, particularly adrenal hormones, if subjected to prolonged stress, (see Sodium Ascorbate for a resolution of this problem). An imbalance hormone secretion will also lead to acidification of the blood and thereby create a condition for oxygen deficiency which ultimately, results in disease. In an experiment we conducted in our laboratory, mice were encased and poked with a stick to irritate and provoke them. Not surprisingly, upon dissection, it was found that all had developed stomach ulcers, some of which had haemorrhaged. An examination of their blood revealed the pH value had dropped by 0.2 on average, clearly indicating that the blood had become highly acidified. With the recent remarkable progress in biochemistry, many warnings have been issued on the relationship between health and diet. Moreover. stress is fast becoming recognized as a major cause of disease. Again, I wish to re-emphasize the necessity of maintaining a constitution that will not produce an oxygen deficiency. This is a conclusion reached after several years of laboratory work with the organic germanium compound and, to date, all the facts have supported it without exception". "After a dose of organic germanium, within a short time the amount of oxygen in the body is not only greatly increased, but dehydrogenation takes place, and poisonous matter is rendered non poisonous, and in about 20 hours is thrown out of the body. Since germanium does not remain in the body, there is absolutely no toxicity, and no harmful side effects that occur with all medicines. When I say that germanium is effective against all sickness, I can imagine not only doctors but people in general laughing and saying I must be joking. In fact, it is proving effective against all diseases, and I believe the doctors are going to have to reverse their ideas of medical practice, and treat sickness on a holistic basis, since it deals with the whole nature of man and his life environment. I am convinced that this organic germanium compound promises to be more important than any other drug, and its study requires a long period: in spite of the cost research should be continued for the benefit of humanity". "People will tell me with wonder among other experiences the disappearance of warts, the outgrowing of corns and splinters embedded in the skin, healing of eczema's and healing of burns without scars with little of the accompanying pains resulting from those burns, or of early subsiding of herpes. While this shows the effectiveness of organic germanium in minor ailments, later descriptions will deal with its effectiveness in much more severe and obstinate diseases. If people experience only small effects, if any, this only goes to show that their condition is worse than thought, thus an increase of the prescribed dosage is required. Where the body' cells lack oxygen, so indispensable to life, a gradual decline in bodily functions is inevitable and lastly the fire of life will be extinguished. This is my personal opinion, but it seems that forces working towards the improvement of health and forces working towards an aggravation of physical conditions are in constant struggle within our bodies, and the condition improves or worsens depending on which of the forces gains the upper hand. What is commonly applicable to all cases is that prescription of large doses of organic germanium immediately after a definite diagnosis brings wonderful results". "A phenomenon that occasionally bothers patients who are prescribed organic germanium could best be explained as a cure reaction (deceptive phenomenon in Chinese medical herb therapy) which causes a certain condition to become worse. This, however, should not cause additional anxiety but rather be judged as a sign that the treatment is beginning to have an effect. In such cases it is necessary to increase the dosage for a certain period (between 7 to 14 days) in order to overcome this phenomenon. The larger the dosage, the quicker will be the breakthrough. This is the beginning of a chance for cure, and it is most inadvisable to suspend administration by mistaking the condition for a sign of aggravation". "Letters of gratitude from people who have been suffering from Behcet's syndrome, aplastic anaemia, sarcoidosis and incurable hepatitis, which Japan's Ministry of Welfare designates as incurable diseases, fill the files in my study. Here is one short note of gratitude from an 86 year old woman living in oklahoma, Japan, who had chronic asthma, white cataracts, was hard of hearing and passed her days in darkness. "Since I have learned about germanium, I have had no more pneumonia, I can hear, and now I am able to read my favourite books again." She enclosed this verse: My umbrella grows heavy day by day But germanium helps me carry on. Each letter is an indictment against modern medicine and a record of people who have found new light in life amidst intense suffering. Just as a small candlelight can be seen from afar in the dark, the fame of my work on the organic germanium compound appears to have reached far corners of the world. Thus numerous letters imploring to obtain the compound are pouring in from such countries as Switzerland, Germany, Australia, Romania, Canada, and the U.S.A."
"My friend had this to say. "Rather than being similar to modern is more pharmaceutical medicines. this organic germanium compound like one of the traditional Chinese medicinal herbs. I have used it to treat a number of different illnesses, and have found its healing effect to be more constitutional than allopathic that is, it acts on the body as a whole rather than on any specific symptom. "To put it more simply, your organic germanium cures diseases by inducing the body's own natural healing powers. I am convinced that by increasing the flow of oxygen, organic germanium stimulates latent natural healing powers existing in the human body, thereby resulting in a very effective cure of any illness." From the way in which various diseases had been cured by organic germanium treatment, I too, had become aware of a rather close link between the action of organic germanium and natural healing processes in the body". "I recall a story about a chemist who was asked to analyze a transparent liquid in a test tube to identify it. He immediately made its analysis and reported that the liquid in question consisted of a large quantity of water and a tiny quantity of calcium, sodium and potassium salt. He could not find out that the liquid was actually tears shed by a mother in sorrow. At the outset, I intended to describe the therapeutical efficacy of germanium. I would like to stress the need for scientists, particularly medical scientists, to free themselves from the shackles of straitjacketed thought patterns that compel them to be "one dimensional human beings." and to enter into meditative thinking of higher dimensions. Physicians tend to depend on medical treatises that only represent the surface of a mirror, and fail to see anything through it. All they do is follow what appears on the surface. Such a mono dimensional conduct will hardly succeed in saving lives". "I can only long, night and day, for germanium therapy to become universally available. I deem it advisable to treat organic germanium not as a pharmaceutical but as a means of a therapeutical system which we should build for saving mankind. Germanium has much in common with Chinese medicine, as I have pointed out earlier, and is in harmony with the Oriental medicine, which means that "Natural Therapy Will be Perfected With Germanium: In closing, I borrow the words of FriedrichSchiller, "The future wavers, but wavering draws on, the present passes swift as an arrow, and the past sinks into the silence of eternity."